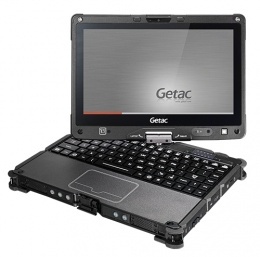 It is ready for anything: the V110 from Getac is a multi-faceted and extremely robust convertible PC - a notebook and a tablet in one device. Top performance with 6th generation Core i5 or i7 processors, 4 GB RAM, the 11.6'' HD touch display and illuminated keys make the V110 a sought-after tool in every environment and in any weather. Equipped with MIL-STD-810G, MIL-STD461F and IP65 standards, the V110 is pre-destined for harsh working conditions, such as moisture, cold, dust, impacts and vibrations. When it comes to communication the Getac V110 is ideally equipped. While the standard dual-band 802.11ac Wi-Fi and Bluetooth (v4.0) support users with the necessary flexibility of movement, you optionally speed up data exchange with the mobile broadband function Gobi. Additionally optionally available are variants with highly precise Descrete GPS modules for positioning. The integrated Intel HD graphic 520 also allows for graphics applications and the near-instantaneous display of maps and layout plans. Even in bright sunshine the V110 offers 800 Nits and Getac's LumiBond display technology, designed to meet the necessary challenges for optimal readability. Thanks to its two exchangeable batteries, enjoy up to 13 hours of operation with the V110, with increased protection against data loss and failure. Both batteries may be changed independent of each other. With additional replacement batteries you enjoy nearly limitless operating times with the powerful V110 convertible PC. The integrated front webcam is perfect for real-time video communication in HD video quality. Thus for documentation purposes, high quality moving images are also possible. On the rear you will find an integrated 8 megapixel auto-focus camera, for high resolution digital photos. Via the practical expansion slot you add optional extra features: choose between an express card and a smart card reader. The V110 features a fast Solid State Drive (SSD) for local data storage, with either 128 / 256 / 512 GB RAM. This is more than enough for larger projects with high data volumes and even demanding applications. Thanks to a large display the robust V110 convertible PC is excellent for more than just field work. In combination with the optionally available vehicle or office dock the V110 quickly becomes a stationary PC. There are additional interfaces available via the docking station, plus the device recharges at the same time. The two serial ports, one VGA and HDMI graphic output, four USB interfaces and one network port open additional options at your desk or in a vehicle. Of course, you receive additional corresponding accessories for the V110 convertible PC upon request, such as a vehicle adapter, power supply, carrying case, etc.